I have generally enjoyed books by Alister McGrath. He is a professor at King’s College in London and president of the Oxford Center for Christian Apologetics. He is basically a mid-stream evangelical who you really identify with at one point and are really frustrated with at another. For example, in this book he is really good at giving help in approaching atheists, but runs with the theistic evolutionists. He gives very good help in dealing with contemporary issues such as Dan Brown’s Divinci Code, but leaves narrative interpretation open to discussion. He criticizes postmodernism intellectually, but believes it gives us good tools for reaching the current culture. “The task of apologetics is therefore to prepare the way for the coming of Christ, just as someone might clear rocks and other roadblocks from a pathway.” Alister McGrath, Mere Apologetics, p. 22. “Apologetics does not and cannot convert anyone. 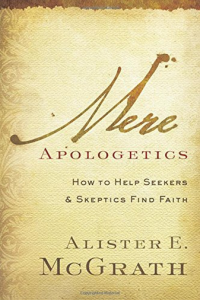 But it can point people in the right direction by removing barriers to an encounter with God, or opening a window through which Christ can be seen.” Alister McGrath, Mere Apologetics, p. 43.